Please use this handy chart to choose the brush that's perfectly suited for your head of hair! This is the cleaning brush included in all Mason Pearson hair brush boxes except the pocket sized brushes. Designed for Fine, Normal, Thick, or Coarse hair types & Medium to Very Long hair styles. The Pocket Mixture is a blend of Nylon & Boar Bristle intended to pull through fuller hairstyles with ease and comfort. Pure Boar Bristle with 1 nylon bristle in each tuft. 6-3/4" x 2". 5 rings of bristle and nylon tufts. 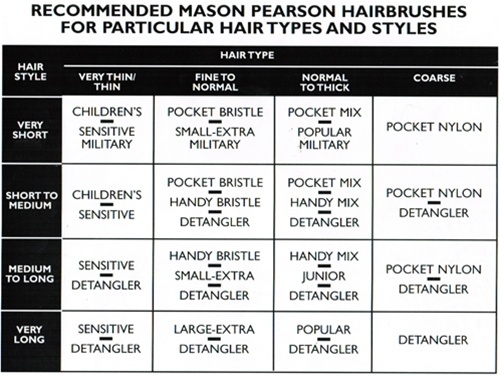 The Mason Pearson Nylon Detangler brushes through even the toughest knotts. All nylon. 8-1/2" x 2-1/2". White only. 5 rings of nylon tufts. Designed for Very Thin & Short to Medium Length hair. The Mason Pearson Child's blue hair brush is ideal for boys ages 3 to 6. Softer pure Boar Bristle. 6-3/4" x 2". 5 rings of fine bristle tufts. The Mason Pearson Child's Pink hair brush is ideal for girls ages 3 to 6. Softer pure Boar Bristle. 6-3/4" x 2". 5 rings of fine bristle tufts. Designed for Normal to Fine to Normal hair types & Very Short to Medium hair styles. The Pocket Bristle is a Pure Boar Bristle brush. 6-3/4" x 2". 5 rings of stiff bristle tufts. The Handy Mixture is a blend of Nylon & Boar Bristle intended to pull through fuller hairstyles with ease and comfort. This size fits well in large handbags. Pure Boar Bristle with 1 nylon bristle in each tuft. 6 rings of bristle & nylon tufts. 8-1/2" x 2-1/2". The Mason Pearson Junior. Pure Boar Bristle with 1 Nylon bristle in each tuft. 9" x 2-3/4". 7 rings of bristle & nylon tufts. Softer Pure Boar Bristle. 8-1/2" x 2-1/2". 6 rings of fine bristle tufts. Designed for Very Fine or Thinning hair types and Short to Very Long hair styles. The Mason Pearson Popular. Pure Boar Bristle with 1 Nylon bristle in each tuft. 9"x3-1/8". 8 rings of bristle & nylon tufts. Designed for Normal to Fine to Normal hair types & Short to Medium/Long hair styles. The Handy Bristle is a Pure Boar Bristle brush. 8-1/2" x 2-1/2". 6 rings of stiff bristle tufts. Softer Pure Boar Bristle. 5-1/4" x 3-1/4". 7 rings of fine bristle tufts. Designed for Very Fine or Thinning hair types and Very Short hair styles. The Mason Pearson Popular Military. Pure Boar Bristle with 1 Nylon bristle in each tuft. 5-1/4" x 3-1/4". 8 rings of bristle & nylon tufts. 5" x 3". 7 rings of extra stiff bristle tufts. Designed for Fine to Normal hair types and Very Short hair styles. Designed for Normal to Fine to Normal hair types & Medium to Long hair styles. The Extra Small is a Pure Boar Bristle brush. 9" x 2-3/4". 7 rings of extra stiff bristle tufts. Designed for Normal to Fine to Normal hair types & Very Long hair styles. The Extra Large is a Pure Boar Bristle brush. 9" x 3-1/8". 8 rings of extra stiff bristle tufts.